Our road toll is too high and over the last 12 months 330 people died on our roads. While absolutely that number is an improvement compared to decades ago, it is an increase on recent years with three years ago it reaching a low of 249. As a comparison, per capita Sweden has less than half the number of road deaths that we do. 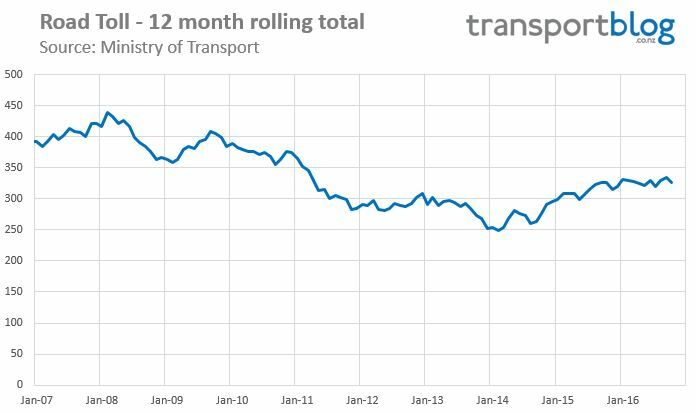 Here’s our road toll over the last decade showing it having increased. If we had Sweden’s level of road deaths we’d have only 137 per year. The Ministry of Transport say that in 2015, speed was a contributing factor in 101 deaths, 496 serious injuries, and 1,831 minor injuries. Yesterday the government announced a new Speed Management Guide which the Ministry say will modernise how speed limits are set. It includes the ability to raise speed limits on some selected roads to 110km/h, which the media have latched on to, but also allows for speed limits to be lowered easier too. That’s good as it means once implemented could make it much easier to have lower speed limits in urban areas – I understand the process currently for doing so is fairly laborious. 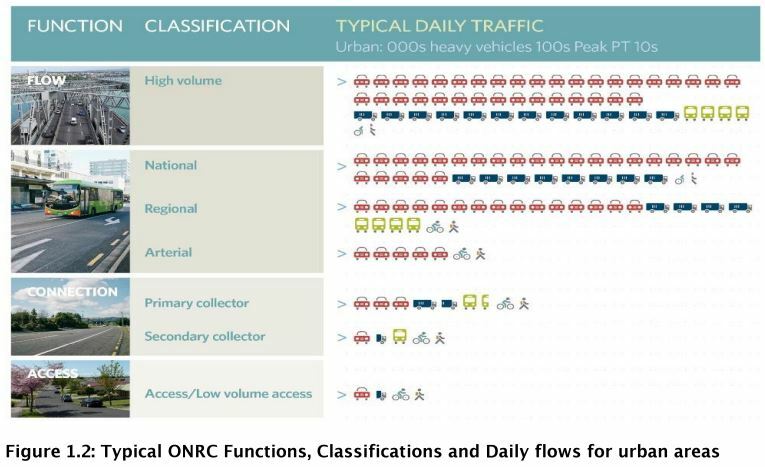 Examples of these for urban and rural areas are below and includes information on modes and volumes that could be expected in situations. 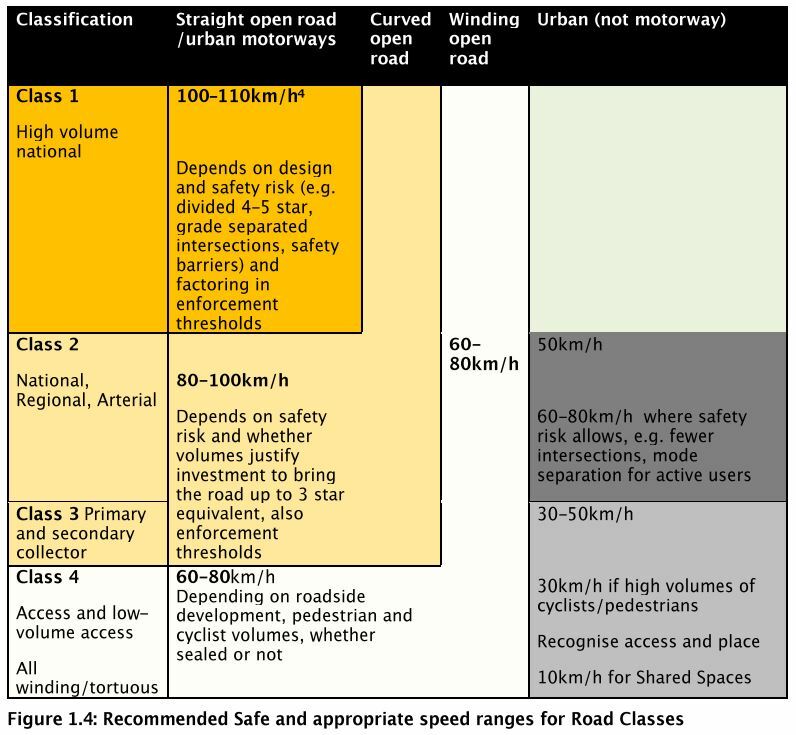 The Framework sets out safe and appropriate speed ranges taking into account road function, design, safety and use. The ONRC has been through a moderation process, but will still be sense tested through the speed management lens as an Important input to determining the safe and appropriate speeds on the network. This Guide steers RCAs to where the highest benefit opportunities lie on their networks. It should begin to underpin all speed management activity, such as engineering and investment decisions, land use planning, fleet management, communication and enforcement. It will also progressively become embedded into planning, engineering and network management. With these in mind, the proposed safe and appropriate speeds for different types of road fall within the ranges shown in Figure 1.4. The proposed speed ranges are not in themselves speed limits, and no changes to the default limits are proposed. Risk can be reduced by investing In infrastructure improvements to make a road safer at current speeds, or by managing speeds down through a combination of road design, risk targeted enforcement and safe behaviour, all reinforced by the speed limit appropriate for the road. And below are the proposed speed ranges. The guide does say these aren’t limits and no changes to the current default limits are planned. The various classification tools used to determine speeds are meant to be to ensure speeds are set appropriately for the conditions. 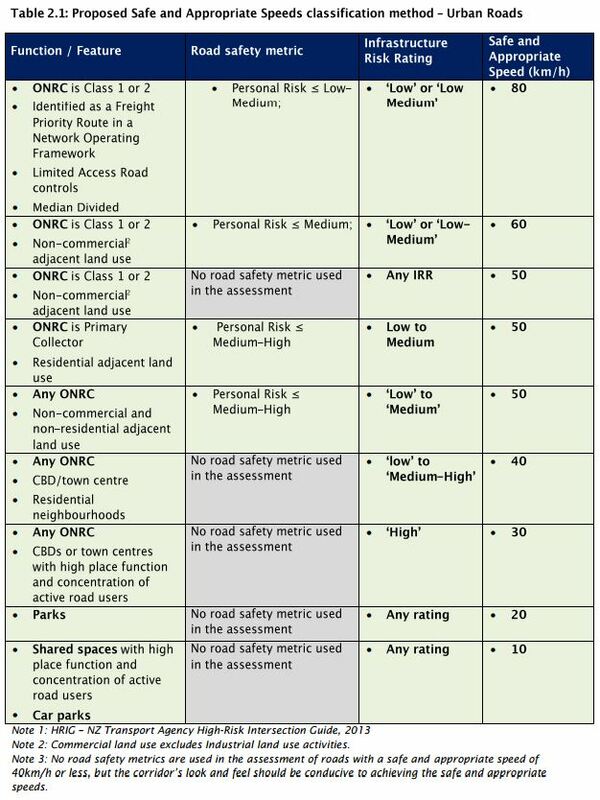 Below is a table listing different urban road types along with various risk ratings and just what the proposed speed might be. There are a couple of concerns I have with this approach. Reading the document, while I’m sure better than what we have now, still feels very engineering driven. In some ways it is pick the speed limit you want and then design the road to meet that. In urban areas that could have big consequences the amount of land needed for some roads. I also wonder if some cases if we could see agencies push to ‘Engineer Up’, upgrading roads at often great expense, rather than just lowering speeds to appropriate levels. And what impact this will have on overall economic evaluations as travel time savings usually play a large role in the justification for projects – although to achieve the travel time savings for some projects, such as Puhoi to Warkworth, you’d have to be driving much faster than even the new proposed 110km/h limit. Takanini to Bombay section of the Southern Motorway (SH1). Huntly and Hamilton sections of the Waikato Expressway — when completed by 2019. Northern section of Christchurch Motorway, SH1. Overall I don’t have too much problem with the proposal. The increased 110km/h limit is being confined to only a handful of locations but the changes proposed also provides the opportunity for more sensible speed limits in many of our urban areas. Return to rising crash rate: epidemic of driver distraction, cos phones. Lower speed will always help, even with this problem. Ask any cop what the real problem is on our roads and you will be told its not speed, its dickhead behaviour. Some people through attitude are unsafe at any speed. The faster the dickhead the bigger the mess. And speed is a primary dickhead behaviour. You are totally right. 110kph is painfully slow for a motorway or highway. I believe you could argue, its dangerously slow. At 110/kph I would be bored to distraction – the speed should be 130kph. Modern cars with ABS, Disk brakes, wide tyres are able to stop a lot quicker than the cars that were on our roads when the current speed limits were set. The problem in NZ is the low standard of driving. Running red lights is epidemic and I have seen private cars, school busses, trucks, police cars, motorbikes and cyclists all do this. It is madness – if its red for you, its green for someone else. Also – what is with the head on collisions? Dont overtake on blind spots, when you approach a corner, slow to an appropriate speed. It is not rocket science but while Kiwis continue to run lights and overtake where they can not see if the other lane is clear, they will continue to die – regardless of the speed. An accident at 90kph is pretty much as likely to kill you as an accident at 110. Lets increase the limits on the big roads and lower them in residential areas. Sorry Patrick but speed alone does not cause crashes, it is only a factor and while higher speeds make more of a mess speed in excess of the posted limit is not even a major factor is crashes. There seems to a fixation with cause. Risk is a combination of likelihood and consequence. Consequence is directly proportional to kinetic energy which in turn is proportional to the square of the speed. An increase in speed from 100 km/h to 110 km/h results in a 21% increase in kinetic energy to be dissipated in the event of a crash. Even if we discount any increase in likelihood of a crash due to an increase in speed limit (eg. reaction times) the risk increases by 21%, all other things being equal. What is the benefit that exceeds this 21% increase in risk? Who said speed alone!? I actually specifically pointed to phone distraction. This is a well studied field, and there is no single cause. Still; reduce speed and the severity of the consequences of all crashes reduce, whatever the cause or causes. Car design must have an effect on pedestrian death rates with bull bars having a much higher kill rate than rounded fronts but it is still speed that kills, human reaction times don’t increase with speed and are fine for an animal that can do 20kph but as speed increases our peripheral vision decreases, if we want high speed travel then do like other countries, invest in high speed rail. you will never compete with speeds in excess of 200kph by road. I agree the transition to 110km/h is a logical step. After all, it’s deceleration, not speed, that kills. Well constructed highways that minimise the likelihood of an abrupt stop have a huge positive impact on road safety. As mentioned many times there would be set criteria for high speed roads, dual carriage, separated median, limited access. Some of the RoNS would qualify, but I doubt many constructed prior to this period would be capable. There are other roads and highways that should have a lower limit as well. SH 1 between Kaikoura and Oaro was reduced to 80km/h many years ago and is unlikely to change soon. Transmission Gully is supposed to be steeper than the Ngauranga Gorge which has an 80km/h limit. Will it really be suitable for such speeds? I heard about a motorway in Sydney which got dropped from 110km/h to 80km/h following a series of nose to tail accidents. re Transmission Gully – Its not all going to be up and down – some of it is going to be gentle, almost rolling flat. So: parts of it will be restricted to 80 (both uphill and downhill), and other parts may be more speedy. But with something like 24 bridges as it swings from one side of the faultline to the other, or passes over streams in ravines, with 3 massive interchanges and 11 different geological conditions, it’s certainly going to be an interesting ride. Personally, I’d be recommending slow down and smell the roses. But I’m willing to bet that with the steep slopes as steep as Ngauranga, but 3 times as long, the toll on heavy laden trucks will be massive. Any sensible truckie will therefore continue taking the coast route, leaving just the cars to roam the new road. There aren’t any pedestrians on motorways or expressways…..
That’s a “somewhat” specious set of statistics. Not that they are necessarily “wrong”, but they can easily be misleading. About both of those could have huge effects on the results. If 30kph areas are 2% of the 60kph areas, the difference in outcome is nothing but statistical uncertainty. If the pedestrian density is 2x, it’s still noise. If the pedestrian density is 2x and the area was 5% instead, it’s probably not noise, but it might be. Simple irrefutable facts. Displayed everywhere, everyday. No sophistry will change this, no matter how much y’all love to drive. Nope. No sophistry at all. I even agree with you. Just pointing out that the facts you used to prove your point are blatantly easy to manipulate and you should be more careful about how you accept/present them. So based purely on kinetic energy, you would expect ~1.6x increase, instead you get a ~4x, why? so going from 50 to 60 you might expect a 1.44x increase, you get ~1.75x, why? You’re forgetting that speed affects both the likelihood AND consequence of crashes. You’ve outlined the consequence part of it. But faster speed also means a lesser amount of time available to react within the same distance to the hazard. So you’re more likely to have the crash in the first place. So does this mean the Police will finally start enforcing the 10kph limit in shared spaces? This would be nice seeing as Fort St is dangerous in the morning most cars and trucks go 50 through there. Although with the cobblestones you can hear them coming. So based on this new system could the East West link be totally negated by just sort the road out and raising the limit to 60 or even 80? And yes I know the East West link even in its current form has a terrible BCR. While I agree to a point that it shouldn’t, when it is multi laned it may. Take a look at other 60kph speed area in Auckland there are plenty that shouldn’t be while there are others that are not that realistically could or should be. According to this document it can’t. Too many HCV’s too many driveways, too many side roads. and I agree it should not be but the point I was making was about other 60kph zones in Auckland that also should not be while there are others that should be that are not. Generally a lot of busy streets could do with a lower speed limit. We can start by reducing the speed in the CBD and town centres to 30. The speed limit on Queens st for a lot of it is already 30 but the average is still over that and I have not yet seen a cop giving out tickets. There’s no mention in any of these papers of increased accident risk, fuel consumption, cost/benefit, or the differential with 90kph limited buses and trucks. These need to be raised when consultation starts early next year. Although the headline is 110kph, this paper is probably more about cutting speeds from 100 to 80 on many roads for safety. 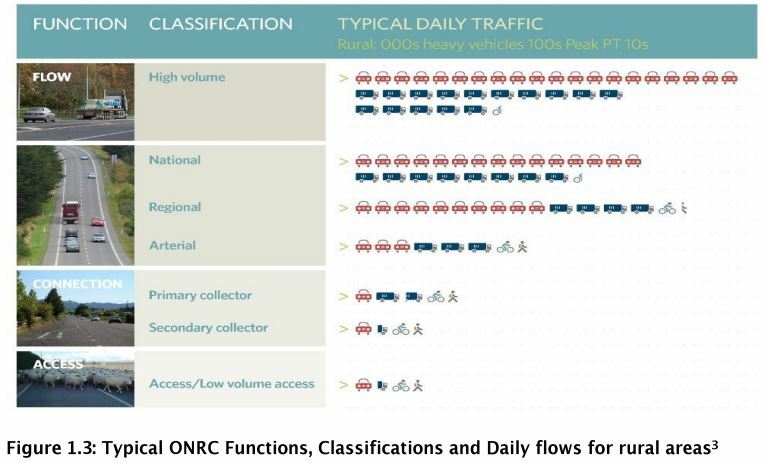 Experience in Australia (http://acrs.org.au/files/papers/26%20Dua_PR.pdf) and Spain (http://www.itf-oecd.org/sites/default/files/docs/13irtadreport.pdf) suggests slower roads are safer and use less fuel. Yep the truck lobby would 100% support ‘investments’ in the upgrading of roads. 30-40 kph should be brought in for residential streets asap. Is this just a dressed up way of a government excuse to spend more $$$ on roads? ^ tongue in cheek comment. just trucks towing trailers ? Or all trucks at all times? Its the trailers that are the real problem at high speeds when they get the wobbles…. For the record, half of our fatal crashes last year happened on the open road and didnt involve speeding. BUT Speed is a risk magnifier and an important factor in many fatal crashes (but not all). People don’t need to be idiots to get themselves and others killed, just one lapse of concentration is all it takes. People will always make mistakes, speed decides the consequences of the mistakes. I think last year 1/3 of fatal crashes were related to speed, but many of the drivers were young with half of the drivers in those crashes under 30. 90% male and 40% werent wearing a seatbelt. So there are plenty of other factors at play as well. I totally support the 110km/h zone on the very few sections of SH1 where you can justify it. I regularly do that speed anyway. Of course they need to couple it with even more stringent fines on anyone who exceeds that limit. I also totally support 30km/h limits on pretty much any urban residential streets as default. People will automatically reduce their speeds, even if not to 30km/h. 30% have speed (over the limit or to fast for conditions) as a recorded factor. On the contrary, I think that 100% of fatal crashes were related to speed. No speed, no kinetic energy to dissipate, no fatality. That is an almost genius level of pedantry :-). Well actually I think one driver died when his car blew up in flames and another guy drowned. They weren’t killed by speed. Speed related doesn’t only mean excessive speed, lack of speed is a huge contributing factor to open road crashes. Speed related crashes is always used as an excuse to continue to do the same in regards to road safety. Excess speed in excess of the posted limit is a very minor factor in road crashes but it still gets all the attention when excess and unsafe speed not in excess of the posted limit (on roads where the posted limit is too high as a result to the blanket speed limits imposed in this country) is ignored even when the majority of speed related crashes are speeds under the posted limit. Yes, people often conflate the terms “travelling over the speed limit” and “travelling at excessive speed”. These are very different things. The former may get you a fine. The latter may get people killed. Blanket speed limits is just how it works. Imagine the mess if they would impose a different speed limit for every bend and corner in the road. No other country does this. And there’s other conditions as well. There may be heavy rain, snow or fog. Fog is especially tricky as it can be very local, you can go to good visibility to less than 50 m visibility almost instantly. So yes we can have variable speed limits, or ‘safer speed areas’. But these can do only so much. Drivers have to ‘drive to the conditions’. Windy narrow country roads should not have the same speed limit as multi laned well lit, well drained expressways/motorways with medium barriers but under the blanket speed limit system used in this country they are. I fully agree that those 155km stretches of road should be increased to 110km/h. Those roads are one of our safest to drive. Majority of accidents involving cars in NZ are those rural roads. What I’m hoping from this proposal however is that speed limit in the CBD’s in Auckland, Manukau etc. be reduced down to 30km/h. There is no need to go 50km/h in a CBD. You are never in a CBD just because your passing through, you are there because it is your final destination or your starting point. Looks like according to the recommended speed limit chart that State Hwy 1 from Taupo to Turangi will be an 80 kph road. As the Road Safety Manager from Waikato NZTA said “it’s a rural road with a low safety rating”. People (and the media) often seem to focus on the maximum possible speed limit allowed in different countries but, rather like what is being talked about here, typically it only applies to only a small subset of roads overseas. Most roads that look like our typical rural state highways and other local back roads will generally only have a speed limit of 70-90km/h elsewhere. A few years ago , Sweden went through an exercise of rationalising their rural speed limits. For every one road that went up (80k to 90k, 100k to 110k, etc) about SEVEN roads went down in speed. Fine with raising the speed limits on some stretches if they are built for it. So….why are roads being built for speeds in excess of the current limits?…and why are you fine with an increase in safety risk and emissions for a given section of road? What is the benefit that exceeds these disbenefits? The sections where 110 km/h is proposed are mostly rural motorways. That’s a new thing in NZ, we didn’t have a Waikato Expressway 5 years ago for instance. So it’s logical to see some discussion about what the speed limit on these roads should be. Even 130 km/h can be very safe, but the road has to be built up to certain standards. For instance, any on-ramp must have a long enough merging lane to allow merging at full speed. Also, drivers have to know they should merge at full speed, I regularly see people merging on the motorways now as slow as 60 to 70 km/h, which is dangerously slow. Motorways in Europe also have a minimum speed you have to keep if conditions allow (70 km/h in Belgium), for a good reason. Overall if used right this is a good move. Motorways designed for 110km/hr should be used at 110km/hr (although they should also be enforcing our no undertaking and keep left rules). At the same time we need to be enforcing lower speeds in central locations, CBD streets should be 30km/hr etc. I agree about the lowering of limits where required but with the setting of limits that suit the road and its location I believe some of the roads being looked at for 110kph limits could even support higher limits in places. We don’t have no undertaking and keep left rules on motorways. If you read the rode code we do, motorways are not separated within the road code are they? Interesting. Is that a recent change? I’m used to these laws from driving in Europe. There is no undertaking allowed. Overtaking typically means changing lanes before and after. Trucks are slower and as a consequence almost always stay on the outer lane. If you’re fast (close to the speed limit) and there’s no congestion you can stay on the inner lanes, overtaking slower traffic on the outer lanes. Contrast this to driving on the motorway here, you usually stick to the same lane all the time. People fully expect to be able to overtake you on either side, and more specifically they don’t expect you to change lanes unless you have a slower car in front of you. On any lane you frequently get slower traffic in front of you. It’s weird to see those rules in the road code. It’s such a different style of driving on motorways. And NZ drivers definitely follow the latter (you don’t have to keep left & undertaking allowed). It’s absolutely unmistakable. This is literally the first rule in the printed version. Yes, I’ve seen that. But nobody does this. And I really mean nobody. As I said above, you’d see a completely different style of driving on motorways. If you ever drive on motorways in Europe, you’ll definitely notice that difference. There’s no ambiguity over here — de facto you’re allowed to undertake and to keep right on our motorways. Well, it is not quite as black and white as all that. On a road with a passing bay, there is always a notice saying “Keep left except when overtaking” or some such. Pretty clear instruction, which I reckon most people obey (except perhaps little old men wearing a trilby driving a Morris Marina in Masterton – you know who you are!). Very different from when you get on a motorway, with dual marked lanes, clearly allowing two parallel lanes of traffic – no signs saying keep left at all. Therefore, implicitly, this is a different situation and undertaking is allowed. Despite what it may say in the Road Code. Am I right or am I right? I’ve even had a cop undertake me on the left at cruising speed. No issues there. Yes and generally on the rural motorways people tend to keep left as well. To give an example of just how bad things work if not everyone picks the same system: In Europe, most people strictly follow these no undertaking / keep right rules. Now sometimes you see a guy cruising at 80 km/h on the second lane. The no undertaking rule then in effect creates a bottleneck for traffic overtaking him. This will cause massive nuisance for people behind him, even if there are 4 lanes. On a given stretch of road it is in fact pretty black and white. A bit less so than for instance the choice of keeping left vs. keeping right, but still. You have to pick one or another. And from observing you can always unmistakeably tell which one. The weird thing here is that it apparently conflicts with the road code. There are keep left rules in both the Land transport act and Road user rule, the land transport offences and penalties regulations has the fine at $150. There is nothing specific to undertaking but if you are keeping left undertaking is difficult if not impossible. The second thing to note is that by definition if you are traveling at the speed limit you could not possibly be holding anybody up (other than emergency vehicles). So who is more wrong, the person traveling at the speed limit in the left lane or the person undertaking in the right lane? I’ve seen that in Belgium as well but it is uncommon. I don’t think there’s a hard and fast rule, but generally you move to the next lane when the road signs tell you it’s an exit only lane. Road markings will also indicate that well in advance. And yes even at the speed limit you’re required to keep to the right. Of course there’s some variables, if there’s a lot of trucks (which have a lower speed limit) then cars generally stay in the next lane if there’s not too much traffic. When it’s busy traffic just fills up all lanes as it does here. On-ramps are not a problem because they are required to have long merging lanes. You won’t run into a situation like here on the southern motorway, with a lot of on-ramps with their short merging lanes. I think that’s a critical detail we have to get right before we really (in practice) require traffic to keep left. I don’t see it as a great idea. Especially without proper driver training, I see more fatalities due to people driving outside there ability at 119 kph. If they do Change speed limits I expect to see more speed signs posted and even have the speed painted across the lane every 1 or 2 kms And at on off ramps. Remember part of the specification of being higher speed limits is the median barrier. This takes away the risk of head-on crashes, so our rural 100km/hr roads are still more dangerous in comparison when speed limit is raised on these stretches. While there were no doubt a number of factors at play, the following figures are a telling reminder about what happened last time we raised the speed limit. Basically, it sends all the wrong messages about road-safety to a nation of “she’ll be right” drivers. Dave while I get the point you are trying to make, it does not compare to the 1985 blanket rise in the open road speed as this time it is about allocating speed limits based on the road and it’s location rather than blanket increase and there will be many places where speeds will be reduced to a level they should have always been at. Agreed, it’s not directly comparable. However I have a problem with a transport system that already kills and injures these sorts of numbers being given any relaxation of limits at all. If Air New Zealand or KiwiRail or the Cook Strait ferries had this sort of accident rate they would be grounded just like that. It is not a relaxation of any limits, it is more about applying appropriate limits to match the road and it’s location. The road network is also not comparable to Air NZ, Interislander or Kiwi rail as they are transport operators rather than an open network. The fact that the road-mode uses an ‘open network’ should not make it immune from the kind of interventionist action that would shut down the air, rail or sea modes if they had a fraction of the casualty rate that the roads do. A life lost is a life lost, whatever kind of network it is lost on. If we were serious about bringing the road casualty-rate down to that of the other modes, we would start by lowering pretty-much all speed limits everywhere, until we worked out some other way of keeping the toll down. You can not compare an open network with closed networks operated by licenced operators with well trained professional drivers. Speed limits that suit the particular road rather than the current blanket limits we currently have will make the road network safer, I don’t understand why you are against suitable speed limits. I regularly travel from Wellington to Auckland at speeds over 300km/hr. That thing “30kph in residential where cyclist/pedestrian volumes warrant” is arse about face. you make streets 30kph in order to attract pedestrians and cyclists by making them feel safe(r). there’s bugger all bikes and peds round my streets partly because they’re scary be on /next to. slow the speeds down and you might get kids biking to school. Yes, people never talk about that. It’s always about the big ticket items like cycle highways and protected cycle lanes on arterials. But a problem here is that seemingly even the smallest local street has to be at least an 8 metre wide highway, it has to have parking on both sides and cars have to drive 50–60 km/h. This forms an additional barrier to cycling: you can have the most awesome cycle lanes on your main streets, but they’re of limited use if people can’t safely cycle from their home to that cycle lane. And there’s no way we will ever put cycle lanes on every last local street. The way other countries solve that is indeed to lower the speed limit to 30 (not 40), and have cyclists and cars share the street. I’ve read the whole document and it’s pretty thoughtful and thorough. It’s interesting how the media just headlines “110kph! !”, when that is really a tiny component of the whole thing. Mostly the document talks about each road controlling authority assessing their suite of roads and seeing if the current speed limits meet the type of road, traffic volumes, injury rates and the current speed of vehicles. The main results of this guide will be to lower a lot of the urban road speed limit to less than 50kph, which will be appropriate in town centres and narrow roads in some suburbs, where drivers may often only be driving at 30-40kph in real life anyway, so it will reflect reality and slow the 5% of drivers who try to go 50 inappropriately. The 110kph is only recommended to be considered where the divided motorway/expressway has at least two lanes in each direction and no direct access to properties (on/off ramps only, grade separated intersections) and where the traffic flows mean that congestion is rare. That seems pretty appropriate to me. It also won’t be an automatic policy. The document goes to painful lengths to remind the road controlling authorities that they should consult with the public extensively and listen, listen, listen! I’ve been getting used to the local speed limits in the Northern Territory working over here for the year. Outside of Darwin, most highways are 130kph. The roads are like most NZ highways – sealed, but only two lanes total, divided by a painted centre line – main difference being the roads are straight and there’s nothing but red dust or sparse vegetation around. Not suggesting we do that, but the proposed 110kph on rural motorways in NZ seems pretty sensible. Yes. It’s the wild west here. People drink themselves to death quite literally. The top end has the highest broken jaw rate in the known world due to drinky-drinky, punchy-punchy. Also a lot of broken hands not surprisingly… And, yes, the road toll isn’t one to hold up as a model. Most of the road trauma is single vehicle roll over, which is a mix of drunk driving, long distances/fatigue, speed, animals on the road. Only benefit is you do feel like you’re getting your destination a lot faster at 130 cf 100. Especially when there’s essentially no one else on the road. Seems a lot clearer now with the speed limits. Interesting what will happen with speeds within urban areas that now gave higher speed regimes than 50. It is difficult to see how the new system could be anything but an improvement. The current system focuses narrowly on the development on either side of the road. It uses a points system based on driveways and land uses to derive half the score and road and environment features for the other half. BUT the kicker is that the total is never allowed to be more than twice the driveway score so in essence unless you get a good high score for that you can’t set a lower speed limit. Bends, crests, lots of bikes, no footpaths etc end up counting for very little. Houses on one side gets you a 70 and houses on both gets you a 50, schools also count. But the result is speed limits that often just dont match with the nature of the road itself. Coming from Belgium I can assure you it can be a lot worse than over here. Imaging driving north from Henderson, seeing a 90 km/h limit on Don Buck Road between all those houses, and then 70 km/h on the state highway between a few paddocks. Imagine explaining to someone who is learning to drive what the hell is going on. It used to be that bad over there. I’m not even exaggerating this time. The current situation is a bit less crazy, but has the obvious artefacts of political whims. Speed limits depend more on which council happens to set them than on anything else (street type, houses, to name a few things). Same story with speed limit signs, every council does something totally random. For drivers just figuring out the speed limit while driving on unfamiliar streets is an almost intractable problem. In comparison, it’s so easy to read speed limits in Auckland, and it usually makes sense. Driving in Britain for a few years, as a number here have, higher speeds are okay on good roads. But our roads are crap! Built cheaply compared to the concrete surface motorways in the U.K. where 120 km/h are fine. Build better quality roads, please. (What’s the impact of lorries on the U.K. Motorways, anyone? British Columbia (BC) in Canada introduced 120km/h on sections of the Coquihalla Highway (Hwy 5 east of Vancouver to Kamloops) and Hwy 97C (Meritt to Kelowna). The interesting part of this was that the 85th percentile speed for these highways essentially didn’t change with the increase from 110km/h to 120km/h, with most people staying below about 122km/h. Having driven the roads a number of times I tend to average just over 120km/h, but this is primarily due to fuel costs increasing by close to 50% if I stay at about 128km/h (police in BC typically allow 10km/h above the speed limit). Note that these highways have adequate design speed, are separated 4 lane highways with appropriate barriers and/or clear zones, and provide truck climbing lanes where needed (in other words there are many sections with 3 lanes in one direction). Statistically the frequency and severity of accidents have not significantly changed since the introduction of the higher speed limits while resulting in a reduction in speeding tickets. One final note is that BC is now trialing sections of variable speed signs, to help people that don’t understand driving to road conditions. These highways include relatively high mountain passes (1400m to 1700m above sea level) and can have poor winter driving conditions (snow, ice etc) that some motorist don’t understand can’t always be driven at the posted speed limit. Good point. More rail is needed. I’d prefer rather than building more roads that the ones we have have good quality surfacing. Will be good to see some reductions in areas. Our long, wide residential road gets some real fast travellers now and then, including trucks taking short cuts or driving from their home at great speed. Agree with raising speed for the newest safest motorway sections. That approaching Puhoi section feels like you are jogging across Utah’s salt flats and getting no where. In total there were 8,732 deaths or serious injuries on Britain’s motorways in 2013, according to figures from the Department for Transport. That’s fine? What level of death and maiming do you consider acceptable? I don’t see anywhere in my post saying deaths are fine. I consider we need to have good quality roads in New Zealand in order to even consider an increase in speed limits. With a population of approx 64.1 million for Britain that is a 0.0001362 per cent fatality rate which I agree is unacceptable. From your statistics, what percentage was due to speed? Jeff T, you are a factor of 100 out in your calculation! However the figure of 8,732 is incorrect for the 2013 fatality rate. The official figures are stated in my comment below. Oh yeah, I didn’t type in the x 100 figure. Thought it looked a bit small. Thanks. OK Jeff, when you stated that 120km/h is fine on UK motorways what were the criteria that you implicitly referenced in making that judgement? Fine from what standpoint? I have no idea. Your question, however, illustrates my point above, that the focus seems to be entirely on cause rather then consequence. Since risk is the product of likelihood and consequence it follows that for a given (non-zero) likelihood of a crash the risk increases with increasing consequence. Given that the energy to be dissipated in a crash is proportional to the square of the speed it also follows that, in general, the consequence (and hence risk) associated with an increase in speed on one of those UK motorways from 100 km/h to 120 km/h is 44% higher even if the likelihood of a crash is not increased (which is not the case). The argument that because a road (or cars) is safer by design (ie. the likelihood of a crash is less) the permitted speed should thus be increased suggests that there is an implicit level of risk that is regarded as acceptable…or maybe it’s the mistaken belief that if a crash occurs the outcome is completely random…or maybe it’s a belief that the likelihood of a crash is zero and hence the consequential aspect is irrelevant. I don’t know and am hoping that some debate on the matter will tease that out. People (myself included) do stupid stuff while at the controls of vehicles. Keeping speeds down limits the catestrophic consequences of that poor behaviour. As for the actual figures for death and serious injuries on UK roads (or any other for that matter), I suggest that had similar figures been reported due to terrorism or zika virus or space alien attack there would be huge headlines and panic on the streets. In 2014 the figures increased. Ooops! Apologies MFD, my mistake. I belatedly notice that the figure you give of 8,732 deaths+serious injuries, you quote as being on “Britain’s motorways”. The figures I have given are for ALL roads. Your figure may be right for just motorways, but if so then I am surprised. The claim normally made for motorways is that they are much safer than other roads (median barriers, slip roads, no pedestrians+cyclists etc), but your figure suggests that fully 37% of all reported casualties happen on motorways. Correction to correction (it’s late at night). Your 8,732 figure suggests that fully 37% of all deaths+serious injuries on the roads (23,370) occur on motorways, not “all reported casualties” as I stated above. This is completely different. This includes all reported minor injuries as well, and the UK figure for 2013 for all reported casualties was 183,670 (same source as cited above). 37% is surprisingly high, what is the proportion of km travelled on motorways over there? Motorways are safer than any other roads by a considerable margin. In Flanders (northern half of Belgium) they accounted for 38% of km traveled, 13% of crashes with injuries and 7% of fatalities in 2013.